The Phone List view of the Address books. Entries can be ordered by clicking on the header of a column. Clicking again reverses the order, eg from ascending to descending. The columns can be customised - right-click on the header and select Customise - check or uncheck fields and they will immediately by added or removed. Drag a column from the list of columns to the required position onto the header in the position you want it. One or more Categories can be attached to an Address Book Entry here. 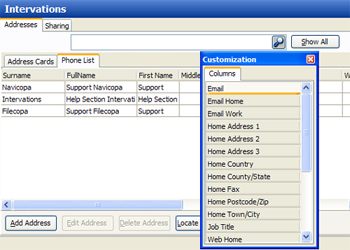 If the Categories field is added to the Phone List, the list can be ordered by Category by clicking on the header.